Good mornings are a very good supplemental exercise for your posterior chain – glutes, hamstrings, spinal erectors. Performing them with a dead stop increases the effectiveness by forcing stricter technique and reducing rebound from the stretch reflex. Dead stop good mornings are nearly identical to standard good mornings. By coming to a complete stop at the bottom before coming back up, you reduce the impact of the stretch reflex, and force your hamstrings to work very hard to overcome the stop. Bar Placement: Use the low bar position, this will help you keep the bar from slipping up onto your neck as you lower it – which can be very unpleasant. The bar should rest on the back of your delts at the base of your traps. Slide the bar down your traps until you find the groove between your delts and traps. 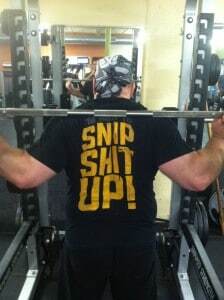 Squat Rack – Use the squat rack’s safety pins so that the bar comes to a complete stop at the bottom of the movement. Set them at a point where you can get a full stretch in your hamstrings without flexing your knees to get to the pins. T-Shirt – Use a relatively tight t-shirt. The bar will be less likely to slide on a t-shirt than on your bare skin (ie a tank top). A tight t-shirt will keep the shirt from sliding between the bar and your skin. Chalk – Running chalk along your back and shoulders where the bar rests will help keep the bar in place. Stance/Foot Position: Use a narrow stance to maximize the stretch of your glutes and hamstrings. Your feet should be set about shoulder width apart with your toes pointed forward or turned slightly outward. Hand Position: Grip the bar as close to your shoulders as your flexibility will allow. Keeping your hands in closer to your shoulders will tighten your upper back, increasing your stability. 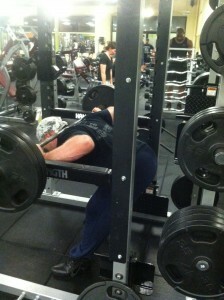 Unrack and set up as you would for your squats. Take a deep breath filling your lungs and abdomen and hold it. Drive the air down and tighten your core, blocking to create intra-abdominal pressure which will stabilize your spine. Push your hips back and rotate at your hips lowering the bar to the pins. Grip the bar tight to prevent it from rolling or sliding up onto your neck. Keep a slight flex in your knees but don’t bend them as you lower or raise the bar. Flexing at both your knees and hips will reduce tension on your hamstrings. Lower the bar in a controlled manner until it comes to a complete stop on the safety pins – don’t bounce the bar off the pins to start back up. After the bar comes to a complete stop on the pins, pull the bar and your torso back to the upright position using your hamstrings and glutes. Don’t flex your knees at the bottom and squat the bar up. Squeeze your glutes to lock your hips forward at the end of the movement. Range of motion should be just low enough so that you get a good stretch in your hamstrings. Don’t lower your torso beyond where it is parallel with the floor. Don’t lower the bar so low you have to flex your knees to reach the pins. The weight used will be significantly less than the weight you use for back squats. Because this lift can put a great deal of stress on your lower back, keep the weight relatively light until you have your technique perfected. Flexing your knees as you lower the bar: Flexing at both the knees and hips will reduce tension on your hamstrings, reducing the effectiveness of the exercise. Rounding your back: All of the hinge should be at your hips, keep your back flat throughout the full range of motion for each rep.
Not using the full range of motion: Failing to stretch your hamstrings will reduce the effectiveness of the exercise. Use a weight you can control with perfect technique. Complete each repetition under control and with correct form. Keep your back flat, don’t allow it to round while lifting.